If one appears in court and is compelled to provide evidence to win his case, the best witness is an eye-witness. Here-say is dismissed by the court and vigorously challenged by the opposition. An eye witness, however, can win the case. That is also the reason many states issue penalties for an eye witness leaving the scene of a crime. It is the most valuable and solid evidence! So, why is it that so many history texts will quote a second, third, or even tenth removed anecdote as evidence to “prove” their rendition of our history? Laziness is my first guess. But we have also allowed ourselves to be taught by such second rate material, seldom challenging it. We ought to be more aware of the material and the authors we chose to read. So when I see a book whose blurb tells me it contains eye witness accounts, I pay more attention. As I read through The Pilgrim Chronicles, I quickly checked out each reference to see if the first-hand account came from a truly accurate source. To the best of my skeptic ability, the references to diaries found, many original letters used, and dedicated research were authentic. Actually, I was surprised at the number of letters Gragg was able to amass: letters written between families; letters written to secure more help, goods, or supplies from back home; letters to and from clergy, and letters which were collected into diaries. But let’s get to the actual text. Is it worth your time? If you have not read at least 20 original documents, letters, diaries, or primary accounts of the trials and testings of the Pilgrims who left England as a persecuted and hunted group, then this book is a must for you. 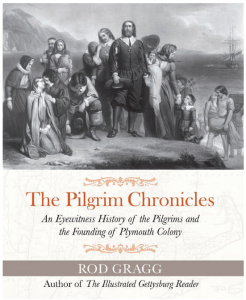 Alongside the usual suspects, Robinson, Brewster, Bradford, and Standish, Gragg includes at least 20 more Pilgrims by name, including their letters or diaries of what the actual voyage and settlement at Plymouth Colony were truthfully like. One tying thread runs through every one of those diaries and letters: that without their faith in the Almighty God to whom they prayed often, the task would be untenable. Even if only half of these letters were available to us, it is more than enough to convince the reader that the Pilgrims intended to found a country where the primary foundations were complete trust and faith in God.